For all of you potential stove buyers with cramped living requirements (e.g. mobile homes/boats/small sheds) this stove is the answer to your prayers. The Newport is both compact and reliably, providing soothing heat to a variety of environments. It may not be the most aesthetically pleasing, but it’s flexible fuel options and consistent performance make it the highest recommendation on our tiny stove list. ✔Fuel Variety:Some stoves limit you to burning a specific fuel type such as wood, ethanol, or pellet. The Newport allows for burning of multiple types of solid fuel including: wood, peat, charcoal, coa, and prestolog. It can not burn pellets, but based on the small design of this stove it would be a hassle to load pellets anyhow. That being said, you could insert pellet fuel into the stove, but the heat production would not be optimal. ✔Easy Installation:Established in 1932 Dickinson Marine has been producing high quality equipment for use on boats. The Newport-Dickinson is a favorite of boaters for it’s simple usage and longevity. The heat output is especially great for a room in a houseboat, because it dries out the air and removes feelings of clamminess. This solid fuel heater is not just for boaters though, it is also great for heating tiny homes. The stove is well built and there do not seem to be any reports of easy breakage, so a long period of use is expected. 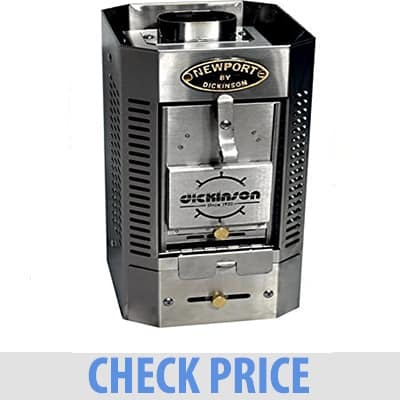 The other advantage with the stove is that it’s relatively cheap price point means you won’t worry as much if you need to replace it. ✔Reliability:The Newport Marine does not require extensive installation. You will need to purchase a chimney and the recommended length is 4-6 feet (6 preferred). Additionally, if you are going to buy the 6ft stovepipe then a barometric damper should be looked into. There is contention on whether or not a damper is required, so be sure to do some due diligence on the issue. These additional components will run about ~$150. There’s not much to dislike about this stove, because it fulfills a very niche task (heating small spaces) and it does it admirably. To say the heating size is too small would be neglecting the stove’s intended function. ✖Design: The all metal design is polarizing, some may find it unappealing after being used to the stunning designs of some home wood stoves, but I find a certain rugged attractiveness in the design. You can still see the masked flicker of the flames through the metal grate, and quite frankly that’s the most important aspect in our opinion. If you need to efficiently heat a small space, and don’t want to have to worry about super specific fuels, complex installations, or reliability then this is the stove for you. The Newport is a popular seller on Amazon, and we give this tiny wood burning heater our highest recommendation. Stay warm!